St Patricks Day is one of our favourite holidays here at The Sweatershop. Every year we look forward to welcoming back the Irish diaspora to celebrate our unique culture and heritage on our national day. From traditional local pubs to lively bars, Dublin is known for its variety of venues to refresh and entertain visitors. Its traditional on St. Patricks Day to have a pint of the black stuff and with that in mind we set out to find out which pubs serve the ultimate pint of Guinness across the city, based on price, atmosphere, history and why they are worth a visit for locals and tourists alike. Take a look at our guide to Dublin pubs, all offering a unique warm Irish welcome across the city from North to South. Where are the cheapest pubs in Dublin? The Snug Bar is centrally located on Stephen Street Upper, this no-frills pub is ideal for a stop-off if you are visiting Dublin Castle or Dubh Linn Garden nearby. Frequented by locals, youll find the interior simple and quaint. The prices for a pint are also refreshingly reasonable. The bar at The Portobello Hotel on South Richmond Street is a lively venue with an intriguing history. During the 1916 Easter Rising, it was seized by nationalist rebels to prevent reinforcements from the nearby British army barracks advancing. Nowadays, you can simply relax with a pint of Guinness and watch the world drift by on the adjacent canal. Famous for its mural dedicated to the 1981 hunger strikers, this unpretentious pub sits on the corner of Dorset Street and Temple Street in Drumcondra, not far from Croke Park Stadium. This authentic pub is ideal for a few quiet pints if youre in the area attending a sporting fixture, with some banter with the regulars thrown in. Downeys on the New Cabra Road in Glasnevin has an authentic feel thanks to its patronage by locals. Not far from Phoenix Park and Dublin Zoo, its known as a warm and welcoming place to stop for a pint or two and a spot of craic with the regulars. The Lark Inn is nestled in the heart of The Liberties, a historic part of the city where you can visit vibrant markets and galleries and one of Dublins top attractions, The Guinness Storehouse. The inn is an ideal place for a pit stop where you can enjoy simple, wholesome food and live traditional music on weekends. This famous Dublin bar is just moments away from St. Stephens Green, Trinity College and the main shopping area of Grafton Street. Its the perfect place for a break from the attractions of central Dublin. You can enjoy a carvery lunch or a barbeque by day and then party into the evening with Diceys late bar and DJ. The Yacht is situated overlooking Dublin Bay. Its outdoor seating area provides the perfect spot to enjoy the quiet atmosphere and watch the water. Youll find the interior beautifully decorated with vintage touches and a tempting gastropub-style menu on offer. This historic pub is set in a turreted redbrick building and will enchant you with its authentic atmosphere and fine selection of beers. Its equidistant between the Jamestown Distillery and Dublin Zoo and Phoenix Park, and will offer you a glimpse into an authentic Dublin community. This cozy tavern near Croke Park stadium is hard to miss thanks to the colorful murals celebrating its proximity to Dublin's top sports venue. Sipping a pint at the bar is the perfect way to whet your appetite before a match. You can enjoy mixing with the current locals and those from past times whose portraits now adorn the walls. This quirky pub on Thomas Street in The Liberties district certainly lives up to its name with its collection of clocks. Frequented by more locals than tourists, youll also find a warm, authentic atmosphere and unusual touches such as an aviary in the back yard. Where are the Most Expensive Pubs in Dublin? If youre visiting the lively Temple Bar area of Dublin, you cant miss the pub of the same name. You can enjoy the full Irish experience here with live traditional music, a range of whiskeys and beer, and local food including their signature dish of oysters, best served with a pint or two of Guinness. Located in Blooms Hotel, this lively pub in Temple Bar is named after the vat house at the Guinness Brewery where Irelands most famous drink is matured in big copper vats. The interior is living history with the wood on the floors salvaged from the citys old vat houses. Enjoy a tasty range of authentic food and drinks while soaking up the historic atmosphere. This bar named after the surgeon, playwright and poet is at the heart of Temple Bar. As you would expect, it offers a lively venue for enjoying Irish whiskeys, beer and food, as well as traditional music. Housed in two of Temple Bars oldest buildings, youll find a restaurant on the top floor where you can sample local dishes, many made from historic recipes. Fitzsimons Bar, situated in the hotel of the same name, is another Temple Bar gem. Arranged over five stories, you can enjoy live music in the main bar or relax in the heated rooftop beer garden with its fantastic views over the area. Traditional dcor and a warm welcome await you at The Auld Dubliner. This pub boasts a mouth-watering menu of traditional dishes such as beef and Guinness stew and Dublin Bay scampi with a backdrop of impressive live music acts. This spacious bar and restaurant centrally located on Dawson Street will impress you with its newly-refurbished elegant Art Nouveau interior. Youll also love the five-star service, sophisticated menu, and the dazzling range of cocktails and many other drinks waiting to be sampled. This unique venue at the junction of Mary Street and Jervis Street was converted from a historic church and comprises a caf, restaurant, and bar, with a beer garden and outdoor terraces. Not only does it serve great food, drink and craic, but you can also revel in the magnificent architecture and even take a tour of the burial crypts. For a lively experience, visit Buskers Bar in Temple Bar, not far from Grafton Street and OConnell Bridge. The bar boasts live music seven nights a week. If the food and well-stocked bar arent enough to tempt you, you can join a cocktail making class provided by one of their resident experts. The Quays Bar offers a full range of drinks and live music seven days a week, while the restaurant on the first floor will tempt you with local dishes such as Irish stew and Wicklow lamb shank. Conveniently located in Temple Bar, its the perfect place for experiencing the classic Irish craic. Situated on Wexford Street, a short walk from St. Stephens Green, The Jar offers more than just its extensive drinks menu. You can enjoy as much pizza as you can eat on Sundays from 3 pm, or try something different with a Paint and Prosecco session where you create your own work of art with a glass of bubbly to inspire you. The Sweatershop is a family run business in Ireland specialising in traditional aran sweaters.We are alsoproud to stock a wide variety of official Guinness merchandise includingGuinness t-shirts, hats, rugby shirts and hoodies and you can now get 25% off in our St. Patricks Day Sale! For true fans of the black stuff! This entry was posted in News on February 27, 2019 by Sweater Shop. Planning a day trip or a vacation to the Aran Islands? These ruggedly beautiful islands welcome around 200,000 visitors every year, all keen to catch a glimpse of real Ireland, escape from the busyness of the modern world, experience traditional culture, and of course, take in the desolate windswept beauty of this unique location. The Aran Islands are a group of three islands in Galway Bay, off the west coast of Ireland. Theyre home to some of the oldest archaeological sites in Ireland and have a fascinating history. Isolated from the mainland until the 20th century, traditional island life continues in many ways as it has for hundreds of years, with most residents making a living through subsistence farming and fishing. The islands are also the home of the world-famous Aran knitwear. Gaelic is the official language of the Aran Islands and is the first and preferred language of most of the residents. These days everyone speaks English too, but if you try out a couple of phrases youre sure to get a smile. If you stay overnight, its a must to hang out with the locals in one of the local pubs, where you can enjoy a pint or two and listen to traditional live music. Inis Mr is the most westerly and the largest of the three islands. Its only around 9 miles long and less than 2.5 miles wide at its widest point, which makes it easy to travel around the whole island in a day. Its the most popular with visitors and offers the most amenities such as shops, cafes, and accommodation options. The island is home to around 1,000 people and there are fewer than 100 vehicles. Most visitors rent bikes to get around, and you can also take a tour in a pony and trap, which is a popular activity with many tourists. There are minibus tours available, which can be handy if youre on a day trip and want to see as much as you can in a short time frame. Kilronan Hostel A cozy budget accommodation option with small shared dorm rooms. Aonghasa's Walker's Lodge A comfortable mid-price option thats great for solo travelers and serves up a good breakfast. Ard Einne House Good value for money guesthouse with amazing views. Ard Mhuiris B&B A family-run B&B in an excellent location with free ferry transfers. Pier House Guesthouse Great location close to the pier, and with a nice restaurant. Aran Islands Hotel A traditional island hotel with an attached pub that offers regular live music. Tigh Fitz A family-run guesthouse with clean rooms and friendly hosts. Kilronan village This is the only village on all three of the islands and is also the only place on the island with a supermarket and ATM, so its essential to stop here for supplies. Its also a quaint little village thats fun to explore with several cafes, gift shops, and traditional Irish pubs where you can meet the locals. Dn Aonghasa A 2,000-year-old Celtic fort on the edge of a massive limestone cliff. This is the most famous tourist attraction on the Aran Islands and is definitely a must-see. Seven Churches Another archaeological site containing the ruins of several ancient chapels and monasteries. Seal Colony Theres a natural seal habitat that you can see off the coastal road on the way to Kilmurvey beach. Just next door is also a small lake where you can see wild ducks, swans, and other birds. The Black Fort A ruin set atop the cliffs on the southern side of the island with impressive views. Its much less popular than Dn Aonghasa, which makes it ideal for a more peaceful excursion. Dun Eoghanacht A ruined Iron Age fort surrounded by a double circular wall with the remains of several stone houses inside. Inis Mein has a population of only 200 people and is the quietest of the three islands. Its a great place to take a deep dive into traditional Irish life and culture, with many residents still choosing to wear traditional Irish clothing, and various cultural courses on offer such as dance and poetry. SyngesChair A viewpoint on the most western point of the island, where you can see the waves crashing in Gregorys Sound below. This is where the playwright Edward John Millington Synge would sit for inspiration while writing. The Puffing Holes They're holes in the ground at the top of the cliffs that create a spray of seawater similar to a whale when the waves are high. The Heritage House A traditional thatched cottage housing various historical artifacts relating to the island. Inis Mein Knitting Co Traditional knitwear factory where you can purchase Aran Sweaters at discounted prices. An Dun B&B and Restaurant Located in the middle of the island, this B&B offers a steam room, sauna, and delicious home-cooked meals. Inis Mein Restaurant & Suites A boutique hotel experience on the islands with five modern apartment-style suites. Tig Congaile B&B A simple B&B with sea views and organized activities. The smallest of the islands, Inis Orr is a traditional Irish fishing island with stunning sandy beaches. Less than 2 miles long and wide, the island is easily walkable, and you can explore its valleys and sights by foot or by bicycle. The island may be small but it has a fascinating history and like the other islands is dotted with ancient ruins including a buried church that lies six feet below the surface. ThePlassy A shipwreck that ran aground on the island after a storm in March 1960. A nearby pub, Tigh Ned, displays photographs and documents detailing the rescue of the people onboard, all of whom miraculously survived. Obriens Castle A ruined castle dating back to 1585, that was built on the highest point on the island. After climbing the 100m to the top youll be rewarded with stunning views that are particularly spectacular at sunset. St Kevins Church The ruins of the 10th century St. Kevins church are below the surface of the earth, as sand has blown over the site and covered it up over hundreds of hears. Hoever, its been uncovered so you can climb down and explore. An Creagn B&B Comfortable rooms with great views in this modern and clean B & B.
Inisheer Hotel Clean and friendly hotel on the beach with a popular bar. Tigh Ruairi A friendly pub with a cozy B&B attached. Apart from the main tourist attractions on each island, the Aran Islands offer a wide range of activities for solo travelers, couples, and families alike. The islands are relatively flat, making some walks accessible to all fitness levels, with stunning scenery. A popular walk is The Ring of Aran on Inis Mr starting at Kilronan village, visiting the standing stones, Kilmurvey beach, the seal colony, Dun Aonghasa, the Wormhole, and the lighthouse, the walk takes around 3-6 hours and youll be rewarded with panoramic views as well as seeing many sights on the island. The Aran Islands have become a popular place for romantic trips due to their secluded location and moving scenery. Some of the hotels offer wedding packages and you can even have a traditional Celtic wedding ceremony with hand fasting or blessing as the holy well. Fishing is part of traditional life on the Aran Islands and is also a popular yachting locating, particularly in the summer months. Due to the small number of motorized vehicles on the island and the flat geography, cycling is the most popular method of transport for visitors. The 30-minute bike ride from the Pier on Inis Mr Island to Dun Aonghasa is regarded as one of the most popular cycling routes in Ireland. There are a few parts of the world where you can relax and focus in absolute silence, but the Aran Islands is one of them. There are regularly arranged meditation retreats and you can, of course, enjoy your own practice theres certainly plenty of space to find solitude. There is a natural spiritual energy on the islands that has to be experienced to be understood. The Aran Islands have been a place of pilgrimage for thousands of years, and you can visit these sacred pilgrimage locations all over the islands. All three of the islands boast white sandy beaches with turquoise water that rivals the Caribbean islands. They may be a little cooler, but if youre lucky you can get the whole beach to yourself. The Aran Islands are home to a wide array of wildlife with habitats unspoiled by human habitation and modern progress. You can see many different types of seabirds, seals, lizards, over 400 species of wildflowers, and butterflies. TedFest Are you a fan of the cult TV series Father Ted? The Aran islands are the original Craggy Island and Inis Orr is pictured in the opening sequence. The annual father ted festival Tedfest (not to be confused with a TEDx event of the same name) is held annually on Inis Mr.
Aran Island Ferries sail from Rossaveal Ferry Terminal to all the islands year-round several times a day, and the crossing takes around 40 minutes. You can reach the ferry terminal by shuttle bus from Galway. Ferry crossings may be canceled in rough weather. If you prefer to arrive by air, Aer Arann Islands flies to all the islands from Connemara Regional Airport. The flights take only around 10 minutes and you get the bonus of seeing the spectacular scenery from above. This entry was posted in Ireland on August 22, 2018 by Sweater Shop. The Aran Sweater is named after the set of islands off Irelands West coast where it was first created many generations ago. The Aran Islands are located at the mouth of Galway Bay on the Atlantic Sea and are where fisherman and farmers dwelled and worked together. The Aran Sweater was fashioned in this environment and has since been passed down through generations to be considered the ultimate Irish Clan Heritage symbol. It is still very popular today in many knitting circles and is also worn by those who appreciate its origin and symbolism. Aran sweaters are highly sought-after, and still, make quite a fashion statement many years after their creation. Back in the 1950s on the aran Islands, many of the men were a fisherman. Out of necessity to combat the cold and tough conditions of the sea, the women handmade their fisherman husbands aran sweaters to keep them warm. Due to their popularity with the fishermen, they were also sold on the island which helped provide a living for some of the families. The intricate cables, bobbles and stitch patterns make these garments popular for a number of reasons. They are challenging to knit, lend aesthetic appeal to the apparel, and add warmth and thickness. Back then, handknitting an aran sweater took between 3 to 6 weeks to complete. The origin of the Aran sweater can be traced back to Guernsey, an island 400 miles South-East of the Aran Islands. Much of Guernseys trade relied on fishing, and the clothing requirements of fisherman were quite demanding. A fishermans clothes needed to be durable, easy to mend, stain resistant, easy to move about in, be able to provide warmth to the wearer, and if possible, keep out water. Thus, the gansa sweater. The Gansa was a simple design, allowing for free movement. Its dark navy color was stain-resistant to a number of liquids, and the knitting was tight to keep the wearer dry. Over time, the stitches became more complicated. As the popularity of the Gansa grew, knitters further developed the stitching, with noticeable differences seen in Ireland and Scotland. Various types of cable stitches were used: diamond lattices, plates, ropes, and the Celtic Knot design. Before long the stitch patterns covered the entire sweater, creating an even more aesthetically pleasing garment. Before long, commercial interest took hold, and the aran sweater began to really grow in popularity. As it evolved, the Aran sweater was manufactured with thicker yarn, the sweaters were knitted flat and seam is sewn together, and the stitching became looser. This decreased the amount of time it took to knit a sweater, thus increasing the arans production. The Aran sweater is known for its stitching patterns and intricacies and is considered both a practical choice and fashion statement. A myth about the Aran sweater is that the stitches are linked to family names the legend has it that each stitch represents a family second name so that is the fisherman was lost at sea the family would be able to identify the body by the stitch on the sweater although an interesting story, it has not been proven at a fact! While the aran sweaters were indeed knit to keep the fisherman warm and cosy at sea, the idea of each stitch is a family name is, unfortunately, a myth. Due to the expanding population of the aran Islands at the time, the government introduced a board called The Congested Districts Board as a way to come up with ideas of improving the standard of living on the island. The put a lot of effort into farming and fishing and knitting for the ladies. The people of the aran islands decided to bring over some Scottish fisherman to teach the Islanders a few things, they also brought some Scottish ladies who showed how to knit sweaters for a living. So the Irish ladies took their idea and made it their own - the yarn they used in Ireland was much thicker than the fine Scottish wool and the design had lots more patterns to it, rather than just the top which the Scottish version had. In approx 1935, these sweaters were so in demand they started selling them in the Dublin markets! Aran knitting stitches are beautiful, complicated, and represent the lives of the fishermen who wore them. They must be handknitted, are believed to have been symbolic of nature, the sea, and the fishing families who lived on the Aran Islands. The patterns on Aran sweaters are based on Irish Tradition each stitch represents a different meaning and symbolizes something of importance. Here are some of the most popular stitches and their meanings. This stitch represents the basket the fisherman used, and his hope of filling it with his catches. This is symbolic of the rich abundance of nature, and may also possess religious implications. This is, perhaps, the most frequent stitch found on Irish sweaters, and comes in different forms. The plain cable illustrates the ropes of Irish fisherman, promising good luck and safety at sea. A plated stitch illustrates how daily life and hard work are woven together. This stitch is said to promise a long life and strong children. Religious connotations are also thought to be represented. This stitch is symbolic of the landscape patterns of fenced-in fields accompanied by roughly hewn stones that protect inhabitants from strong winds on the island. This is often used as a diamond filler and suggests a respectable harvest. It symbolizes carrageen moss, which is a type of seaweed on the Irish coast that is used as both food and fertilizer of barren fields. This stitch is a reminder of the bee who works hard and assures a reward for labour. This stitch symbolizes the shapes of mesh fishing net, and also stands for success and wealth. This stitch represents the ups and downs that married couples face. When selecting an Aran sweater, there are many different types from which to choose. Some are outlined below. This style is crafted from soft, Merino wool with the cable knit design. This traditional stitch is quite popular because it represents the culture from which it came. Also made of soft Merino wool, this design for men also features the cable stitch, and has a crew neckline. This option is constructed of different types of Irish stitching, starting with the honeycomb around the centre, with cable stitching on either side. The shawl neck aran sweater features delicate Aran stitching with a shawl neck. It works well for both daytimes casual or nighttime dressing up. This Aran wool and trellis stitched sweater is 95% Merino wool and 5% cashmere and is a soft, comfortable option. The turtleneck aran sweater features aran stitching and a turtleneck for added warmth. Featuring Aran stitching, this sweater is 100% Merino wool, and is warm, soft and stylish to wear. Generations after its creation, the Aran sweater is still going strong. Recently the aran sweater made the list of iconic fashion pieces featured in an exhibition in Manhattans Museum of Modern Art. Chosen because of its impact on the world during the last century, it has remained popular in the entertainment industry and fashion world alike. The National Museum of Ireland loaned one of its oldest sweaters for the exhibition, where it was placed beside other fashion elites such as the Birkin Bag, Wonderbra, a pair of Levis 501 jeans dating back to the 1940s, and an assortment of little black dresses. The patterns of our famous Irish Aran Sweater made it into Vogue in 1956 and like that, its popularity went from strength to strength. The made Aran sweaters cool in the States and brought it back to life in Ireland!! The Irish folk band were over in USA touring when a particularly cold spell hit New York. The Clancy Brothers mum send them over Aran Sweaters that they wore live on the Ed Sullivan Show this gave fisherman sweaters a big boost in popularity! They were famed for wearing the infamous Irish sweater each time they performed making it their trademark! Actors such as Steve McQueen, Marilyn Monroe, and Grace Kelly were seen as notable wearers, and it continues to attract much attention from celebrities today. Its unique design and Irish heritage make it a mainstay in popular culture, ensuring it will never be forgotten. In recent times, we have seen even more celebrities rock our beloved Irish aran sweater such as Alexa Chung, Sarah Jessica Parker, Rob Patterson, Kate Bosworth and Gwyneth Paltrow to name a few. This entry was posted in News on August 3, 2018 by Sweater Shop. This entry was posted in News on July 12, 2018 by Sweater Shop. Irish wool knitwear is most iconically represented by the Aran cable knit sweaters. Just think of Clancey brothers kitted out in bnine (Irish for white) wool jumpers. The Aran tradition derives from the West of Ireland, especially the Aran Islands, where traditional fishing communities would have made their clothing by combining stitches such as the cable, honeycomb, blackberry, moss and basket stitches, trellis, diamond, and the tree of life among the most widespread. This is the background of a relatively recently born and widely popularised fisherman sweater. A fascinating rise to fame and stylistic ingenuity has ensured, that Aran knitwear has not only survived into the 21st century but has become one of the most inspirational lines of Irishcraft. Today, brands such as Carraig Donn, Original Aran Co., West End and Irelands Eye offer countless contemporary and classic versions of the Irish Aran sweater. From the traditional crew-neck pull-overs to cardigans, coats, and tunics - every company has made their contribution to offering freshly up-dated and versatile styles. 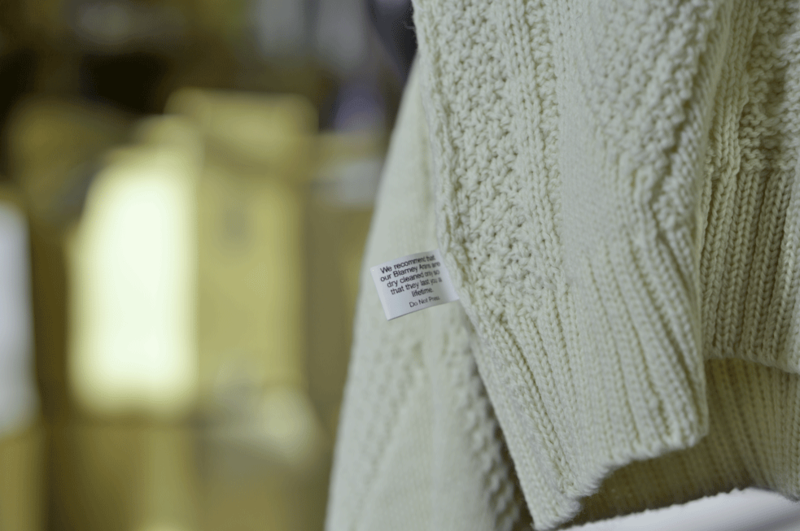 The creativity of our Irish knitwear makers combined with modern technology, and a keen eye for changing aesthetic vocabularies, produces a range of apparel that could not be dreamt of only a century ago. They fill our store with an array of garments that stand out - each with different and attractive necklines, cuts, and lengths. The Aran cable and derives from the North of the West of Ireland, Co. Donegal. Many people think of tweeds in association with the said region. But, of course, the same wool colored and spun into a rainbow of multi-tone yarns goes into the making of tweedy fisherman sweaters. It is said, that the colour combinations for Donegal yarns owe to close observation of the palette of nature, rendered with an artistic exaggeration - so to bring out the dreamiest, and most evocative of hues. Fisherman out of Ireland, Donegal Design, and Studio Donegal is notable for bringing the best of this side of Irish craft to our stores. As with the Arans, nowadays there is much more choice, including the diversification of materials used. Albeit, we still stick with only natural fibers there are sweaters made with the coarser Irish wool, soft Merino wool, and, even some cashmere blends. People often come back to the store looking to replace one of their Donegal fisherman sweaters after years of wear, because of how fondly they have worn them. There is an undeniable character in every so beautifully colored garment as that. And, nature is a superb designer! This entry was posted in News and tagged Irish Cardigan, Irish Knitwear, Irish Sweater, Irish Sweaters on June 19, 2018 by Sweater Shop. Classic, comfy and well-knit, the traditional Aran sweater is today worn as a trendy statement and the perfect start to a cosy fall or winter outfit. But it traces its roots to the 17th century and the tale spun around its identity is as unique as its name. Now, the modern Aran sweater is a relaxed and elegant number that can be paired with many different looks and styles that focus on comfort and ease. There is also something beautifully structured about the sweater and this all comes down to its variety in knit styles. Learn the origins of this transitional wardrobe staple and how to wear an Aran sweater in any weather! The Aran sweater spread from its point of origin in the eponymous Aran Islands, right off the coast of West Ireland. The stitches on Aran sweaters are a mark of Irish clans and their heritages which were abundant in the Aran Islands. These combinations of stitches were essentially family heirlooms. Each pattern tells a clan's or house's values and stories which are passed on from generation to generation. In fact, these patterns were so idiosyncratic that the bodies of the fishermen who might have perished in an accident at sea would be identified using these very designs! Of course, this means that the Aran sweater itself is built to be naturally water-repellant. It can absorb almost 35% of its weight before feeling wet and heavy. Given that its wearers were originally islanders and families from fishing communities, this was the perfect feature. But the Aran sweater is also incredibly warm while maintaining breathability thanks to its natural wool fiber. The wool insulates the wearer and keeps the body at an ideal temperature that's not too hot nor too cold. This balance comes from a high volume of air in between the fibers. It keeps the wearer warm on cold and wet days, making it a staple for coastal Atlantic weather. Bring the indomitable spirit and rich heritage of the breathtaking Aran Islands to your closet with intricately handwoven Aran sweaters. Aran knitting developed when fishermen from the British Isles, who were sent to train the Islanders, inspired the locals with their traditional Guernsey jumpers. Aran Islanders created their own version with cream-coloredbinn wool, which is naturally water repellent due to its natural lanolin oil. A popular export, Aran sweaters became even more fashionable whenThe Clancy Brothers and Tommy Makem appeared on American TV and in a TV special for President John F. Kennedy in the early 1960s; this Irish folk music group wore Aran sweaters on-stage, making it their trademark look. Entrepreneur and Renaissance manP. A. Sochin, who had established the export trade for Aran sweaters, could barely keep up with the demand, even with all the available Aran knitters in Ireland. If you've ever admired the beauty of a Celtic braid or knot design, you'll adore the variety of stitch styles in an Aran sweater. Crafted from approximately 100,000 individual stitches, it's not uncommon for its construction to take nearly two months to complete. The preservation and proud display of Irish heritage is what the Aran sweater is all about. These individual meanings can be combined and a family's values woven through a sweater's choice of knitting. What's interesting is that hand-knit Aran sweaters are harder to come by. While the meaning of stitches is alive and well, there are very few who knowhowto hand knit several of these stitches into one unique pattern. But there's a bonus to adopting multiple stitches into one seamless pattern: durability and longevity. These intertwined and interconnected stitches, along with the choice of wool fiber, make the Aran sweater a unique and highly functional piece. Its stitches give the structure a heavy and supported design. Particular stitches in Aran sweaters are said to convey stories and meaning. The popular "honeycomb" stitch is supposed to signify good luck and abundance, embodying the impressive toil of hard-working honey bees. The "moss" stitch symbolizes the Carrageen moss commonly found on the Aran Islands - a reminder of the knit's birthplace and heritage. The stone walls separating the many fields and built to contain livestock are represented in the "trellis" stitch. The "basket" stitch is reminiscent of baskets used by fishermen, representing a bountiful catch, while the "cable" stitch depicts fishermen's ropes - another embodiment of the wish for a good catch. A reminder of one's fruitful life - calling to mind the omnipresence of wild blackberry bushes on the Aran Islands - emerges from the "blackberry" stitch. The "Tree of Life" stitch embodies the legacy of families, rooted in the strength of ancestors and emanating through generations of descendants. Unsurprisingly, the "diamond" stitch is an emblem of wealth and abundance. The "zig-zag" stitch represents the gorgeous cliffs around the Aran Islands... but is also said to depict the highs and lows of marriage. Many have claimed that these stitch patterns and combinations have been passed down through the generations to tell the story of their lives. Others have argued that the significance of the different Aran sweater stitches is part of a set of myths by one Heinz Edgar Kiewe in his book, The Sacred History of Knitting (1967),because Kiewe likened the Aran stitches to Celtic knotwork. Whatever the case, part of the mystique of Aran sweaters remains connected to the associations the stitches have come to highlight. What is important is what that Aran sweater says to you, and about you. Aran sweaters can be styled shorter, and so they can be layered under with a collared shirt or as a cropped top over a pair of high-waisted pants. Aran sweaters also go great with scarves, and they're beautiful and simple enough to only require accessories as the perfect pairing. When buying and choosing an Aran sweater, you'll want to first look for one that is fitted. This is the modern style and thus makes the sweater a staple. You'll also want to take a look at the kind of neck you want. Will you choose a crew neck, which is best for layering shirts or a roll/turtleneck? Several Aran sweaters designed for women also come styled with cowl necks or off-the-shoulder, wider boat necks. When you wear an Aran sweater, you'll also notice that a more complex pattern can make a sweater seem larger or "heavier" than one that includes only one or two styles of knits. Make sure to consider this. So, how exactly do you style an Aran sweater and what goes well with this iconic top? Well, the first thing to note is the style of stitch (or stitches). Sweaters that involve more varieties of stitch can be standalone pieces themselves. These can be paired with casual, everyday jeans, more formal slacks, high-waisted pants, longer A-line skirts, or even pencil skirts of varying lengths. As for tops, the transitional and effortless ease of an Aran sweater works well with layering with collared shirts, long blazers, and even leather jackets. Keep in mind that if you're choosing jewelry, you'll probably want to stay away from necklaces. Instead, you should opt for details using bracelets, watches, sunglasses, and belts (or a combination). Otherwise, you'll want to choose chunky necklaces that can be worn outside of the neckline. Aran sweaters are also great for color-blocking with your style. Don't worry too much about a "clash" of patterns you can pair Aran sweaters with plaid or tartan patterns. What you'll want to instead focus on are contrasting colors. If your Aran sweater is bright and light or pastel and cream, keep your bottoms dark. However, if your sweater is dark but rich in colour, like aubergine or blood crimson, you can pair this with a pair of white or even brighter blue faded jeans. There is something very collegial about Aran sweaters. This is especially true when they're paired with collared shirts underneath. Somehow, they put one in mind of university students. However, you can make the Aran sweater a little edgier by wearing it with a pair of dark wash jeans and slick, fitted Doc Martens boots. The first thing you'll want to do to take care of your Aran sweater is read the label your sweater comes with. Whether hand-knit or not, the blend of the sweater matters. For example, while cashmere is good for the washing machine, Merino wool works better when dry cleaned. Modern-day wool products can often be washed without much fuss in a washing machine set to delicate. However, it's important to note that some prefer to err on the side of caution. If you choose to dry clean your Aran sweater, you'll only need to use this option a few times a year. Again, this works well for Merino wool sweaters. If you choose to hand-wash, you should be using tepid, not hot, water. Direct heat can cause shrinkage. You also want to avoid stretching or wringing out wool when it's wet as this can permanently destroy the original structure. When drying, lay flat. And when it's try, you might choose to steam on a hanger to eliminate wrinkles, if the blend is thinner. Finally, remember that you can always spot-test to make sure the dye on a sweater doesn't bleed out. Whether paired with your favorite jeans or dressed up with fancy slacks or a streamlined skirt, Aran sweaters are an alluring and versatile addition - or showpiece - to any outfit. Cherish the comfort, the class, and the customary charm of the Aran Islands - made to last, to warm, and to wow. Now that you know where the Aran sweater came from, how to wear, style and look after it. Why not browse our hand-knit Aran sweaters are made with 100% pure wool or let us know how you wear your Aran sweater in the comments below. This entry was posted in Aran Sweaters on May 24, 2018 by Sweater Shop. Emigration is embedded within the Irish DNA - it's our relationship with other countries that have allowed Ireland to become one of the most loved nations. For one day a year, Ireland manages to imprint itself on more countries around the world than any other country in History. St. Patricks Day this year will see 287 globally recognised monuments turn green. This is up from just two buildings back in 2010.Sweater Shop investigatesthe Irish connections abroad and has illustrated this connection for some of the most Iconic buildings around the world. Ireland and France share a long-standing, lovable history that began in 18481. A group of French women gifted the Irish with their national flag. This affair is not all taking. The Irish returned the favour by gifting them with their most famous spirit, Hennessy2. And recently the French awarded Ireland with a medal for our Sportsmanship and Outstanding Contribution at Euro 2016. An event, the Mayor of Paris called a unique moment for Ireland in France. The Irish certainly raised the spirits of a country that had a tough year. The French continue to host the largest Irish cultural centre in Europe, and we continue to adore their language, teaching it to 180,000 of our youth each year2. Long may the relationship continue, one set to strengthen further in light of the impending, Brexit. Ireland and Brazil enjoy excellent relations, politically, culturally and economically. New links are being built, between these two countries. Eight years ago in 2012 Ireland signed a milestone agreement with Brazil relating to education3. Today, Brazil tops the league of non-EU students studying in Ireland, which is more than China and the U.S combined. Brazilian students claim to love Ireland, leaving with a little bit of Ireland in their hearts. The Irish Community living and working in Brazil also continues to grow and includes business people, students on university exchanges and Irish people who have decided to call Brazil home. Its said the Irish communities vibrant and unique contribution continues to make a positive contribution to Brazil. There is strong historical and cultural bond between the Irish and Italian, both sharing a mutual respect for each others traditions. The Irish and the Italians are probably the most like each other. Nations of laid-back people with a sunny disposition, who are extroverted and gentle but also very proud. They are now buried in the church of San Pietro in Montorio which indicates the high esteem the Italians had for our Gaelic chieftains. The Irish American Population is seven times larger than Ireland itself, with a quarter of Bostonians claiming Irish heritage.8 The Irish influence is dominant in American history. Nine signatories of the Declaration of Independence were Irish. In fact, the Irish have more influence on American politics with twenty-two American presidents boasting Irish roots. America was introduced to one of their most loved sports boxing from the Irish. Probably born from the Irish reputation of hot tempers and fervent pugilism. Even the world-famous Irish saying, The Luck of the Irish came from Americans branding the Irish immigrants mining success as luck, rather than skill. The Irish had design involvements in one of Australia's most recognisable buildings, the Sydney Opera House. Peter Rice, from Dundalk, Co. Louth, a structural engineer mastered geometry for the complex roof design. An Interesting relationship, and one that has been less publicised over the years. The Irish Mexican bond is one dating way back to 1611. Irishman, William Lambert born initially in Wexford was the first person to propose the independence of Mexico. Saint Patrick Battalion Irish soldiers also fought for Mexico during the Mexican-American War. In what has been lauded as one of the highest honours ever, because they were fighting for an adopted nation - and they died for an adopted country. The Irish and the Canadians have a love, love relationship. Toronto is a city that was shaped in many ways by the Irish people who immigrated in the 1840s and the impact is still clear to see today. The Montreal city flag includes a shamrock. Irish is spoken in a certain part of Ontario in Canada where the Gaeltacht Thuaisceart an Oilein ir is based (or the North American Gaeltacht). Its also the only Gaeltacht that exists outside of the island of Ireland. A bond that was born from a story largely unknown, reaching back to more than 100 years ago. From a time of epic events at an extraordinarily turbulent but fascinating period of Chinese history. A time when hundreds of Irish men and women made their way to China as missionaries to work in social and disaster relief services. There are also 336 Irish troops from the 109th Infantry Battalion who are currently serving with the UN peace-keeping force, UNIFIL, continuing Irelands long and proud tradition of participation in UN peace-keeping missions. With understanding like no other and love in their hearts, they are committed to making a difference in Jordan. Ireland, and the UK. A history of rivalry from neighbours, with Ireland always the underdog. The relationship is shifting, In 2017 alone, 162,251 individuals applied for Irish Passports from the UK.18No doubt Brexit has influenced this, but a favourable reversal to whats documented in the history books. With Ireland now also the Gateway for the UK to the EU, we hope our friends across the pond continue to be kind to us as a nation we majorly rely on the UK for exportation of goods. To conclude on why the world will light up green this St Patricks Day, we believe this is due to our positive influential relationships around the world. As an Irish, family owned and run business, we are proud to be recognised globally, we are proud our country. Be sure to join in on the St Patricks Day fun this Saturday, and celebrate in true Irish style with your nearest and dearest. To view the list of all 287 Monuments lighting up green on the 17th check out this list from Tourism Ireland. This entry was posted in Ireland on March 12, 2018 by Sweater Shop. An Irish Aran Sweater Displayed in the Museum of Modern Art in New York! The Irish Aran sweater an instantly recognisable iconic style worthy of a place among the Museum of Modern Arts landmark fashion garments. The definition of a classic, in many ways, is how well something stands the test of time, and what meaning it acquires therewith. While the Irish Aran cable sweater has gone through a century of waxing and waning fortunes, today it stands included among 111 fashion garments selected for an upcoming exhibition at the Museum of Modern Art (MoMA) IN New York. The inclusion of an Aran among carefully selected iconic items that have defined fashion over the last century is a clear nod to the artisan craft of Irish knitwear. An array of style icons has been captured wearing the famous Irish wool Aran jumper at various points throughout the last century. Yet its the stories that people tell today that attest to the importance of this craft for generations throughout the years. Its the fact that our parents and grandparents have gone through college wearing an Aran hand-knitted by their grandmothers; the way we too would leave the house for college borrowing mum or dads Aran jumper; and, the memories of kissing our sweetheart for the first time - while wearing that oversized borrowed Aran sweater to the cinema date. Remember all the slagging you may have got for being dressed (by mum - against your will) in Irish sweaters when in school, erstwhile? There seems to be a million lightyears between those days of having to defend your cool against the odds - wearing a frumpy Aran sweater, and the sexiness of it all when considering that Grace Kelly could pull it off, never mind that it is about to go on display alongside the Birkin bag and a pair of Levis 501! This entry was posted in Aran Sweaters and tagged Aran Sweater, Aran Sweaters, Irish Cardigan, Irish Knitwear, Irish Sweater, Irish Sweaters on August 4, 2017 by Sweater Shop. 1. Pre-soak the sweater in a basin of tepid water (at 30C/86F) with a little mild purpose detergent, such as Woolite, or, baby shampoo for a time ranging between a half an hour up to overnight. 2. Gently rinse your sweater, bearing in mind that wool is quite heavy when wet thus, care needs to be taken not to pull it out of shape by dragging or wringing. Some spots may need to be rinsed a little more thoroughly (cuffs, neckline, and the incidental stain), and can be tackled with a stain removing soap. 3. After rinsing through a couple of times to wash off any residual suds, your Aran can be pressed out and towel-rolled (the blocking technique). This means that instead of wringing and pulling the saturated garment, you fold or roll it up into a shape that can be squeezed first, and, pressed while rolled up inside a towel second - to get rid of as much water as possible. 4. The wet garment will still be too heavy to hang up at this point; instead, it will need to be laid out flat on clothes rack and reshaped to its original dimensions. Wet wool moves readily, so dont be precious and give it a tug where some sleeve or body length seems to have gone skimpy. The trick to a drying a wool sweater quickly is to position the clothes rack in a spot where there is a good circulation of air and a source of ambient (never direct) heat. Try reshaping when the sweater is still slightly damp. This is when the sweater is just right for stretching the wool panels back into their original proportions, without overdoing it. Stains can be spot-cleaned without doing the entire garment. Simply wet the area that needs attention, and gently rub some mild soap directly onto the stain then rinse out under the tap. All wool garments let go of odors as easily as they absorb them. Just hanging your Aran sweater up in a room that has good circulation of fresh air coming through it, can completely refresh it in a matter of hours. Finally, the battle with balls of fuzz on areas where your sweater is most heavily rubbed on - by handbags and other layers of clothing - need not be a nightmare. Every knit piece can be restored in your lap while you sit watching TV. To treat a chunkier knit piece: a battery-operated lint shaver comes in handy. The small rotating blades will cut off only the balls of fluff without damaging the yarn so that the stitches remain intact. It is always better to do regular de-fuzzing of your sweater than to let pilling spread and matt. One great tip to take care of your Aran sweater is to 5 minutes to go through the sleeves and around the hips of my sweaters after two or three days of wear, or, before replacing in the wardrobe - with the reward of having each in as brilliant a nick as ten years ago, in some cases! This entry was posted in Aran Sweaters on July 31, 2017 by Sweater Shop. 4th of July & Irish Aran Cable knit Throws! Treat your loved ones this 4th of July with one of our luxurious Irish Aran throws in Merino wool! The story of the Aran tradition comes alive in the cables, diamonds, and moss patterns among an array of beautifully composed stitches that you can drape over your living room couch, your favourite chair, or the end of a bed or bring with you to the beach or to the park for your 4th of July picnic. Show off your Irish roots in an authentic Irish Aran cable knit throw. We have a range of colours in two tone compositions besides the classic creamy Aran white soft lime green, fuchsia, and black/charcoal. There is nothing like the play of pattern to lend any room a sense of cosy comfort, while you sip on a cup of tea, read a novel or doze off with the hum of a tv series in the background Beautiful, soft, and warm these throws are to be shared and enjoyed for years, so gift yourself a quality Aran throw and have a great 4th of July! This entry was posted in Aran Sweaters, News and tagged Aran Sweater, Aran Sweaters, Irish Cardigan, Irish Knitwear, Irish Sweater, Irish Sweaters on July 3, 2017 by Sweater Shop.